My first foray into science was studying parasites under the guidance of George Benz. It is easy to become enraptured by parasites. The ways in which they complete their life cycles boggle the mind (I especially love this Radiolab episode: www.radiolab.org/2009/sep/07/). 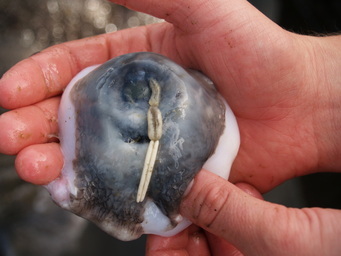 The photo on the right shows a female Ommatokoita elongata attached to the cornea of a Greenland shark. MacNeil, M. A., B. C. McMeans, N. Hussey, P. Vecsei, J. Svavarsson, K. Kovacs, C. Lydersen, M. Treble, G. B. Skomal, M. Ramsey, and A. T. Fisk. 2012. Biology of Somniosus microcephalus. Journal of Fish Biology (Special edition on elasmobranchs) 80(5): 991-1018. McMeans, B. C., J. A. Olin, and G. W. Benz. 2009. Stable isotope comparisons between embryos and mothers of a placentatrophic shark species. Journal of Fish Biology 75: 2464-2474.